You are here : Home / KULINER / Durian Time! Finally last nite I go to Gajah Mada Street with Mister Achan. He bought me 4 durians. What a suprise! Not really actually, because this is durian season. And durian is so cheap right now. But sadly I can't eat it last nite. Because I have to drink my medicine. I got a cough and so dangerous to drink medicine while you eat durian. I wanna push away this cough because I can't sleep well with it. This morning, I wake up, I eat two durians for my breakfast. Make me a little bit hot but I am so happy because finally, I eat them. I still have two durians in my room. Make my room smelly for somepeople. But I like that smell very much. You want to eat cheapest and sweetest durian like me? 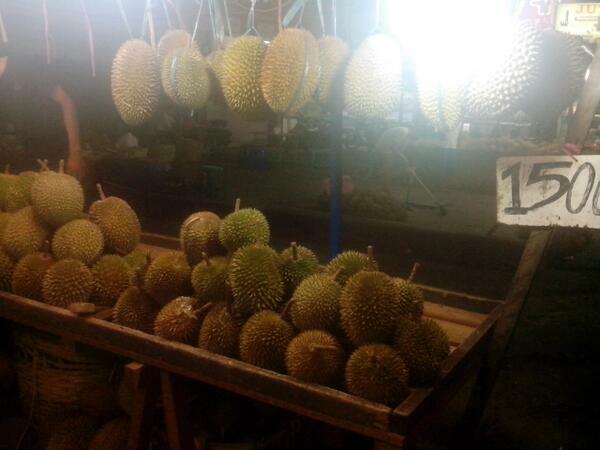 Come to Pontianak I will give you some durians.